How badly did CBP treat visa holders? Read these horror stories. Horror stories about the lawlessness of Customs and Border Protection agents in the aftermath of Trump’s immigration ban. Protesters gather to oppose Trump’s executive order against immigrants from seven muslim-majority countries at New York’s John F. Kennedy airport on Jan. 28. In the days after Donald Trump signed his executive order on immigration, it became clear that Customs and Border Protection officers were not all complying with court decisions limiting the order’s application. How lawless were the actions of these CBP officers? A new complaint, compiled by the Center for Constitutional Rights and the Kathryn O. Greenberg Immigration Justice Clinic at Cardozo School of Law, provides a disturbing answer. The complaint, which was sent to the inspector general of the Department of Homeland Security, contains 26 declarations and affidavits from immigrants and the attorneys who tried to represent them. Their stories range from disconcerting to shocking. According to these testimonials, CBP officers violated immigrants’ rights, contravened multiple court orders, and acted with reckless disregard to the law. The declarations and affidavits allege that elderly immigrants were denied access to food, that lawful immigrants were forced to sign forms they didn’t understand, and that infants were held for no reason. Multiple people were allegedly deported after judges had forbidden such deportations, and others were allegedly denied access to counsel after judges had required that such access be granted. Here are summaries of some of the most striking allegations from these declarations and affidavits. You can read the entire complaint here. Abushamma says she was given food, and permission to call her family, only after she signed the form. She was subsequently deported to Saudi Arabia. 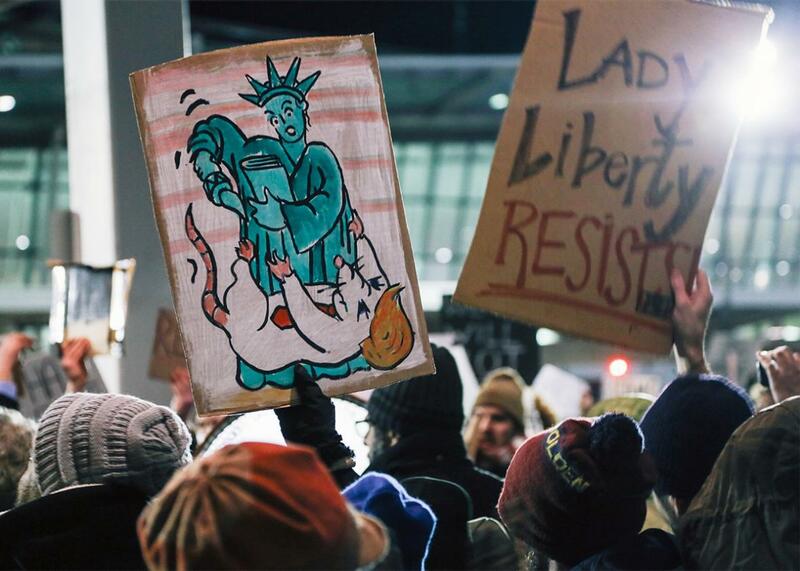 Protesters at New York’s JFK airport, Jan. 28. An Iranian citizen with a family-based immigrant visa, whose son is a U.S. citizen, says he was detained at Los Angeles International Airport for 18 hours. According to his niece, he was not given food or a place to sleep during this entire period. He was asked to sign a document written in English—a language he does not understand—and told that the document said he was leaving the United States voluntarily. He refused to sign it but was then told he had to. He also refused to get on a plane to Dubai; U.S. officials had to physically carry him on. He is now terrified of being returned to Iran for fear of government retaliation. After a federal judge ordered CBP to let detainees at Washington Dulles International Airport speak to lawyers, attorney Ofelia Lee Calderón attempted to speak to two lawful permanent resident clients who were stranded at the airport. She says that a CBP agent told her there was no right to counsel in the airport and asked Calderón to leave. When she returned later, another officer refused to give her any information about her clients. She eventually learned that her clients had been detained and handcuffed by CBP, forced to sign forms relinquishing their lawful permanent resident status, and sent to Ethiopia. At no point were they allowed access to counsel. At Dallas/Fort Worth International Airport, CBP officers reportedly detained an elderly Sudanese woman suffering from diabetes, high blood pressure, and severe kidney stones. They refused to provide her attorney or her family with any information on her health, status, or whereabouts. Her attorney later learned that CBP officers had demanded that his client sign a form withdrawing her request for admission into the United States—or be barred from entering the country for five years. She signed the form. Also at DFW, CBP agents allegedly detained a lawful permanent resident along with her 11-month-old daughter, a U.S. citizen. They refused to let attorneys speak with the mother. When the child’s father came to the CBP office, agents refused to let him see his daughter. 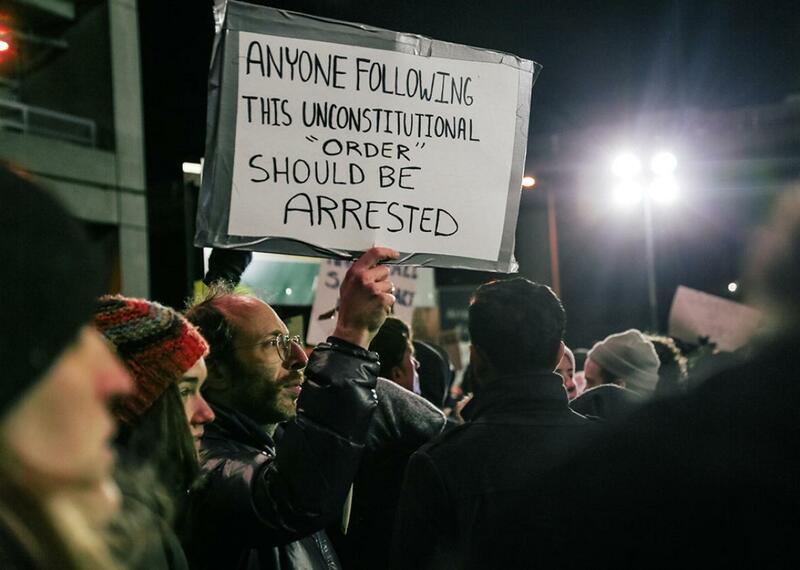 CBP officers at Los Angeles International Airport allegedly deported an Iranian student 90 minutes after a federal judge explicitly barred the deportation of anyone targeted by Trump’s order. They ignored efforts by attorneys to halt the deportation. An elderly Iranian couple—both of whom were lawful permanent residents—say they were detained for 10 hours at Chicago’s O’Hare International Airport after returning from their son’s wedding in Iran. The two were denied access to food for the length of their detention. Another elderly person being detained along with the couple was shaking from hunger and nearly passed out. CBP officers refused to inform the couple’s immediate family whether the couple had been allowed to take necessary medications. The complaint contains 17 other stories of abuse at the hands of CBP agents. Some of the actions described in these declarations and affidavits are legally questionable; others are plainly unlawful. The complaint requests that CBP “end its policy of preventing individuals detained in airports from accessing counsel.” That would be an excellent start. But it is equally important that the courts make CBP officers aware that, no matter how much power the president purports to give them, they have no authority to defy the commands of the courts.